We had the honor of photographing Rachel & Aram’s Wedding which was held in Hyde at the Bellagio in Las Vegas. For those not familiar, Hyde is a posh, upscale restaurant and nightclub inside the Bellagio directly overlooking the famous Bellagio Fountains. The East Coast style wedding was a tremendous affair and we worked with some of the industry’s best. We want to say thank you to Mike & Jeremy from JMT Eventology, Gabriella Cote and the By Dzign team, Shutterbooth, Makeup in the 702 and DJ Harry O for creating and insuring that Rachel and Aram’s wedding day went off without a hitch. We have included a few “sneak peek” images and look forward to delivering all the wonderful photographs and memories to the newlyweds as soon as possible. Thanks again Rachel, Aram and families. What a fun day! Wow! It has been a long time since I updated my blog. I apologize to anyone who may have noticed. We have been so busy these last six months that blogging seems to always get put to the side in favor of other projects. I will try to get back in the habit of blogging our wonderful wedding and events to keep everyone up to date with what we have been working on. It looks like the economy is finally starting to chug along here in Las Vegas and we have already booked so many brides for next year. It would seem that 2014 is going to be a great year for weddings, and we are looking forward to working with everyone. Not that 2013 was a bad year by any means. We have photographed so many fun and fantastic weddings and I look forward sharing as many brides and grooms, engagement sessions and even a few personal projects I have been busy with as well. 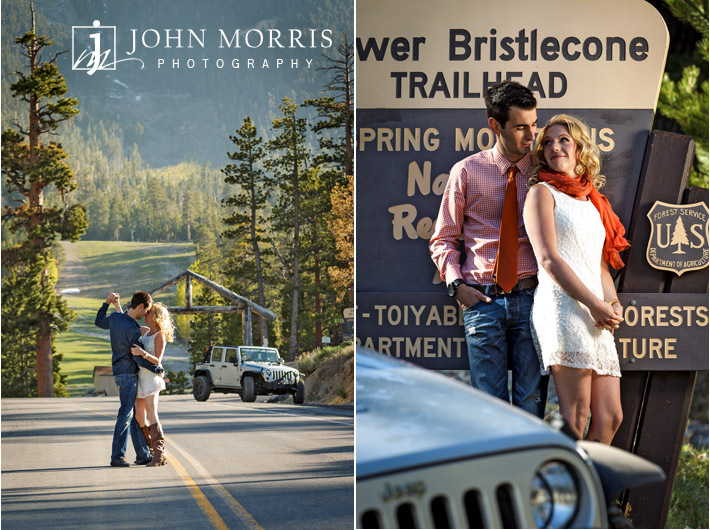 Since her wedding is coming up in just a few days, Sept 22, 2013 at the beautiful Canyon Gate Country Club to be exact, why don’t we start with Kimberly and Jeremy’s engagement session up at the majestic Mt Charleston just north of Las Vegas. Beautiful scenery, cooler temperatures and Jeremy’s love of off-roading, rock crawling and a certain Jeep made this the perfect location for this young couple. I personally drive a 4 wheel drive Toyota Tacoma, (“taco” for short) but I have to admit, Jeremy’s Jeep was looking pretty good. Fortunately for Jeremy, his beautiful bride was looking even better. We had a great time and it was important to capture the fun and energy that Kimberly & Jeremy have for each other and for life in general. The light on the Mountain can be a bit harsh, but with the help of a little extra light, strategically placed and the naturally back lit trees, we were able to create some great images. What do you think? I am looking forward to the wedding day this weekend and working with Keri Keep and her great staff at Canyon Gate. And here is hoping that I can make blogging my adorable brides and grooms a consistent habit.